Whether allergy season is in full fledge, the temperatures have plummeted making the air feel bone dry, you’re battling a cold, or you have a sensitive newborn to comfort, a quality cool mist humidifier can be a valuable addition to your home. Cool mist humidifiers are safer, supplement moisture in the air to help with dry skin, breathing issues, flu-related symptoms, and much more. Below, we’ve gone over some important questions about them, and reviewed ultrasonic humidifiers that really stand out among the pack. Let’s have a look! This is our top choice for the best “cool” humidifier for a few reasons. Mainly, it provides the best value, best overall design, and easiest to use option while remaining powerful enough to provide cool mist anywhere you need it. It’s an all-purpose option that would work for bedrooms, offices, a nursery, or pretty much anywhere that you need cooling and clean soothing mist and humidification. It works for 25 hours on one tank and is very easy to refill. It’s also easy to clean. We really love that this humidifier takes sanitation so seriously. If you are going to put a humidifier into your nursery, you want to be sure that you can trust it. This humidifier uses UV technology to kill over 99.9% of bacteria in the water. It also has filtered cool moisture evaporative technology that allows it to blow moisture off of a wicking filter. This allows it to evaporate more quickly and efficiently into the air with less noise and energy. This device is super efficient. It also totally prevents over-humidification. There’s no margin for error because you’ll always get just the right amount of humidity. On top of all of that, Honeywell has been a long-time trusted air quality improvement leader. This device lets you adjust the humidity of the air in your home by 40-60%. It is an extremely efficient, totally safe, and completely hassle free cool mist humidifier that can be relied on for day after day, year after year. Quiet operation – This humidifier is quiet and undisruptive. Hassle-free – It is easy to use and you can’t accidentally over-humidify with it. A trusted brand – Honeywell is a trusted leader in air quality regulation. Wicking Technology – The specialized wick allows for ultimate evaporation efficiency. Editor’s Choice – this is our top pick for the best humidifier. More expensive than some – The only disadvantage of this humidifier is that it costs a bit more than some similar options. Verdict: Our favorite option, the Honeywell Honeywell HCM350W tackles germs and bacteria while filling a room with clean, fresh, cool mist. It’s versatile, efficient, and of premium design and quality material construction. All around, a fantastic option for just about anyone. It also has great ratings from owners all over the world. For those reasons, it’s our Editor’s Pick and favorite cool mist humidifier so far.We consider the Honeywell HCM-350 to be the best cool mist humidifier for home use, as well as the most easy to clean on our list. The Pure Enrichment HumeXL Ultrasonic cool mist humidifier gives you around-the-clock cool mist humidification with less hassle. 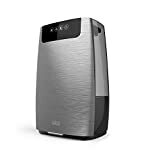 It also features a sleek and attractive design (best looking cool mist humidifier hands down) that would match the aesthetics and decor of nearly any modern space. It produces over 40 hours of continuous mist output on a single tank. This is on the low setting, keep in mind. On the higher settings, it runs for around 16 hours on a tank. We especially like the LED controls and soft glow night light. This humidifier would look at home in virtually any room. It also has 2 convenient independent misting nozzles. This is a unique feature that allows you to aim mist in every possible direction. You won’t have to worry about wet bedding or walls at all. This is also an ETL-Approved product so it’s safer and more dependable than some other options. All around, a great product. It would be our editor’s pick, except that the price is a bit steep. We feel for what you are paying, you should get a bit more. Still, as far as aesthetics go, this is the most attractive cool mist humidifier on our list. Sleek look – This is easily the most attractive cool mist humidifier on our entire list. Simple to operate – This is a user-friendly and hassle-free humidifier. Fast acting – The cool mist output on this device is great. Independent 2 nozzle design – Two independent nozzles give you 360º misting for total cool mist coverage. Unimpressive price – For the price, we feel that you should get a few more features. Verdict: Anyone looking for a cool mist humidifier that will blend in with their decor should probably check out the Pure Enrichment HumeXL Ultrasonic. It’s a sleek and attractive cool mist humidifier that gives you great coverage and in an attractive package. On the other hand, for the price, you may be able to find a more powerful product. Still, as far as looks go, this is an attractive option. It’s also pretty effective, easy to use, and efficient. If you’re in search of a reliable and simple cool mist humidifier for your bedroom, baby’s room, or office, this is a good option. It can go right on the top of a table or nightstand and doesn’t cause many problems in the way of condensation buildup. It also has a handy leak-free design. It is very quiet so it won’t keep your baby awake at night if you choose to put it in a nursery. It also works for up to 30 hours at a time. This is perhaps its most impressive feature, considering how small it is compared to some other humidifiers. The Taotronics 4L can cover areas of around 300 square feet. It also has a nightlight and useful sleep mode. It utilizes filters; both a benefit and a disadvantage. The microporous cartridge filters remove bacteria and other materials from the water for safe to breathe and soothing cool mist. You will need to change the filters every 4-6 months or so. All around, a practical and easy to operate cool mist humidifier. Easy to use – This cool mist humidifier is simple to operate and clean. Practical – A practical and efficient option, it doesn’t add anything overly complicated to its design. Efficient – This humidifier runs for up to 30 hours on one tank making it one of the most efficient options on our list for the price. Good value – For the price, construction, design, and humidifying power, this device is a good value. Quiet – This is a quiet machine that won’t disturb your sleep. Uses filters – You’ll need to replace the filters every 4-6 months. Verdict: If you need a no-nonsense humidifier that sends plenty of cool mist out for a long time, this is a good option. It’s also very quiet, energy efficient, and easy to use. It also has a very clean mist output for safety and easy breathing. It is perfect for children’s bedrooms and other smaller areas. The only big downside is the fact that you’ll have to buy replacement filters. 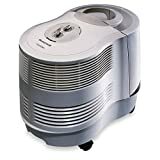 Anyone who needs a cool mist humidifier that can be run constantly year after year should probably take a look at this impressive humidifier by Honeywell. Honeywell is known for their impressive and durable air conditioning units, so it’s no surprise that they’d make a reliable and sturdy cool mist humidifier for indoor home use. This humidifier can be used in multiple rooms. It has a gigantic tank that can run for days at a time. It also puts out massive amounts of humidity so you’ll really be able to tell the difference in your home. This cool mist humidifier allows you to adjust the humidity levels in your home by 40-60%. That’s a lot of cool mist output. The Honeywell quietcare is of quality design and can be trusted to run for years. The most impressive quality of this humidifier, however, is its ability to humidify large spaces. It can easily handle rooms of 900 square feet or more and can even be used for up to 2,300 square feet. That’s some serious humidifying right there. On the downside, this unit isn’t cheap. it costs more many similar humidifiers. However, it also covers a much larger area than most humidifiers out there. It’s also a bit complex and may take some time to learn to use. If you need some serious humidity in your space, however, this is a great option to consider. Covers large areas – This humidifier covers up to 2,300 square feet. Reliable – Honeywell is known for creating reliable, long-lasting, air control products. Large tank – The 3-gallon tank of this unit allows for seriously effective humidifying. Great output – This unit can help you add 40-60% more humidity to an area. Expensive – This is a bit of an investment and is designed for large spaces. Not so user-friendly – This unit is less user-friendly than some other smaller options out there. Verdict: For those who need serious cool mist humidity, this is a good option. It’s durable, sturdy, effective, and powerful. It can easily bring cool mist humidity to spaces of up to 2,300 square feet. On the other hand, it isn’t cheap. this unit is for people who want a permanent humidity solution. We also wish it was a bit simpler to clean, use, and understand. that being said, for anyone who needs powerful, fast, and widespread cool mist, this is a great product to consider getting. Designed in the arid California desert climate, this humidifier functions well and seems to be a great option for users who need to adjust the moisture levels in the air of their home or office. What’s so unique about it is its ability to provide users with both cool and warm mist humidity. It can be set at three different levels. It can also increase humidity levels 25% faster than most other devices of similar design. The warm mist settings can be used to kill bacteria in the air while the cool mist settings provide soothing relief for many ailments. It also displays the actual humidity readings so you’ll know what the humidity levels in your space really are. You can learn what settings are most comfortable for you and always set this device to meet your exact specifications. It has touch control, a remote, and more. Levoit built a pretty good device all in all. It also holds lots of water so you won’t have to refill it as frequently. You have a 1.5-gallon tank that can run for 3 days at the lower settings without needing a refill. 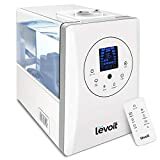 This makes the LEVOIT Humidifier a great option for use in businesses or in a large family room. It’s very quiet as well; it won’t keep you awake at night or disrupt conversations in any way. This humidifier has been designed using premium materials, safe plastics, and other safe substances. Keep in mind though, this model should remain out of reach of children and pets, especially when it’s putting out warm steam. It also costs more than many other cool mist humidifiers. All in all, it’s a versatile and competent warm, and cool mist humidifier that can serve a variety of applications. Warm and cool mist – this device puts out both warm and cool mist making it a versatile all-in-one option. Easy to control – With touch settings and a remote, this device is easy to use and control. Humidity readings – You’ll be able to know the exact humidity levels in your home with this humidifier. Premium construction – This humidifier has been constructed using premium, high-quality, materials. Must be out of reach – If you are using this device around children or pets, we recommend keeping it safely out of reach. Costly – This humidifier costs more than many, simpler, cool mist humidifiers. Verdict: If you need warm vapor and cool mist all in one easy to use device, this is a good option. It has touch settings, a remote, and can even tell you what the humidity levels are in the air around you. On the downside, it’s pretty pricey and should be kept out of reach of children and pets. All in all, a competent and versatile humidifier option. If you need something that will run continuously and provide soothing haze and humidity for large areas, this would be a great option to consider. It’s high-tech, powerful, efficient, and can run for days. Off of a single tank, you’ll get around 96 hours of cool mist humidity output. It also doesn’t require any filter changes. A permanent ceramic filter provides clean and fresh mist output without the need for replacement. This one features an anti-microbial tank and base so you know that you’ll be breathing clean and fresh air. It has been carefully tailored to operate quietly and continuously. This means restful, uninterrupted sleep all night long. It has 5 mist settings so you’ll get the exact humidity output that you want. It has a rotating nozzle as well, so you can aim it away from electronics, linens, and more. The 1.7-gallon tank is super efficient. You could get 12 nights of sleep without having to refill the water tank. Keep in mind, this is at a low setting. If you set it higher, you’ll get anywhere from 5 days to 2 days of cool mist humidity. It also has a fully programmable timer, display settings, humidistat, and more. Another really great feature of this humidifier is its floor extension nozzle. You can set it on the floor without a pool or condensation building up. Finally, it has an aromatherapy tray and a remote. This humidifier is pretty impressive if we do say so ourselves. That being said, it’s somewhat complicated to learn to use. It’s also more expensive than most standard humidifiers. Still, you do get a lot and this thing is very efficient. If you’re planning on using a humidifier frequently, this would be a good option for your consideration. Digital settings – You can adjust the display, humidistat, output, and more. Extension nozzle – You can set this device on the floor and direct the humidified mist in the direction of your choice. User features – The 96-hour operation, variable mist settings, aromatherapy tray, and remote make this humidifier a joy to use. Pricey – This humidifier is more expensive than most. Complex – You may have to set some time aside to learn how to use this device properly. 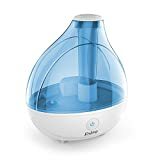 Verdict: For anyone who needs to humidify large rooms and plans to use their humidifier often, this is one of the best cool mist humidifiers to consider. It’s efficient, innovative, well contrived, and loaded with user-friendly features. It even has an aromatherapy tray and a remote. It can run for up to 12 days without needing a tank refill and has been designed to keep your floors and curtains moisture-free. 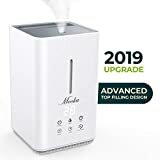 It is a bit more expensive than many other cool mist humidifiers and somewhat complicated to use at first, but all in all, it’s an impressive product. Here’s a quiet and reliable humidifier that can cover large areas quickly and effectively. We especially like the directional mist design that allows you to aim where the cooling fog vapors will go. This means that if you want to place this humidifier on a table near curtains, you can aim it toward the center of your room. This keeps things clean and dry while still getting the air nice and moist. If you’re not familiar with the Vicks brand, you should know that they’ve been a leading force of flu and cold symptom relief for decades. This humidifier has been specifically designed to aid in the alleviation of symptoms like dry and itchy eyes, sore sinuses, and another similar cold, flu, or allergy symptoms. It’s also great for people who get dry passages as they sleep. It stands at 1 foot tall and is about 10-inches wide. This means that it could be put on a table or nightstand easily. It also purifies water as it is converted and dispersed into the air. The Vicks humififier has a clear tank that lets you see exactly how much water is left in the large 1.5-gallon tank. It runs for about 20 hours at a time. When it comes time to refill this humidifier, you can just lift the top lid off of the tank. It also has variable control settings so you can fine-tune the amount of mist that you get. It has a replaceable filter for clean, cool, fresh humidity output. The clear blue tank isn’t very aesthetically pleasing. Also, you’ll need to replace the filters periodically. However, this is a reliable and straightforward humidifier that works efficiently and will get the job done right. It also comes at a pretty decent price. Powerful – Adjust the mist settings for powerful and effective humidity output. Large tank – The large 1.5-gallon tank requires fewer refills. 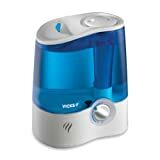 Reliable – a Vicks brand product, you can trust that humidifier won’t let you down. Aim humidity – You can set the direction of the humidity stream so that you won’t soak your curtains or other linens. Not aesthetically pleasing – This model is more about utility and less about design. Uses filters – While you get super fresh mist with less cleaning requirements, you’ll have to replace the filters from time to time. Verdict: This is a utility-friendly unit that delivers powerful cool mist output with less hassle. It can be aimed so you get a humidity cloud wherever you need it most. It also runs for about a day at a time with constant powerful mist output. It has adjustable settings and is of good design overall. However, it isn’t the prettiest thing out there. It’s more about effective output and less about aesthetic appeal. It also will require filter changes which means less cleaning, but more purchasing. The advanced top filling design of this humidifier makes it a smart option for users who prefer a minimalistic design. You add water through a port in the top of the device or through the tank directly. This makes it easy to clean and very stylish in appearance. It has a 1.06-gallon tank as well, meaning you won’t have to fill it up as frequently. You’ll get 15-20 hours of continuous cool mist output that can cover areas of 440 square feet or so. Real-time humidity output means that this model keeps running and running. It also has 3 adjustable mist settings, a sleep mode, automatic low water shut-off settings, and an anion function for low noise levels. It utilizes ceramic vibrating diaphragm components for virtually silent spraying operation as it delivers a cool fog style inhalant. It also has a fan that gives off a soothing breeze. This is the perfect humidifier for a table top desk. Many humidifiers can’t be used on your desk because of the way they put out mist. This humidifier shoots mist straight up and out so it won’t damage electronics as long as you place it correctly. This does mean, however, that you shouldn’t put it directly under any electronic devices. If you have a wall-mounted television, for instance, don’t put this humidifier on the shelf directly below it. As far as disadvantages go, this model does have a couple. For one, it has been known to leak in previous years. While the company has addressed this issue, we recommend being cautious as you first begin using this model. Also, it’s somewhat spendy. Compared to similar models that cover larger areas, this humidifier costs significantly more. That being said, if you need a compact and quiet humidifier that’s designed with high-end materials, this is a good option to consider. Premium materials – This humidifier has been constructed using premium, high-end materials, like ceramics. Top fill design – The top tank refill design is pretty handy. Very quiet – The ceramic ultrasonic vibrating diaphragm of this device allows it to operate almost silently. Includes a 3-year warranty – The 3-year warranty can help give you peace of mind as you use this humidifier. Expensive – Compared to similar models, this unit is a bit pricey. Verdict: For anyone who wants a premium humidifier that’s both quiet and compact, this would be a good option. It’s an efficient device that gives off plenty of cool mist and can be easily refilled. It also has a 30-day money back guarantee and 3-year warranty. On the other hand, past models of this unit have been reported to leak, though this issue has apparently been addressed. It’s also a bit expensive. Still, it’s a high-end little humidifier that’s both powerful and minimalistic. The Ultrasonic cool mist humidifier safely moisturizes the air in your home for up to 16 hours at a time per tank. It’s great for using at night. Just fill it up before bedtime and enjoy peaceful and easy breathing as you sleep. The Mistaire small and compact, so it fits easily on a dresser or nightstand. It also has variable settings for high-speed or low-speed smog output. The settings are clear and simple to adjust. In fact, the entire unit is very simple to use, clean, and maintain. The 1.5-liter tank provides just the right amount of coverage for bedrooms, offices, and other enclosed spaces. It’s not hard at all to fill the tank or to clean the components of this model. This is a powerful and aesthetically pleasing option that would be great for anyone who has allergies, flu-symptoms, or simply wishes that the air around them was of better moisture quality. It also can be used as a night light if you choose to use it in your bedroom. There are features automatic shut-off safety settings that keep it from running when the tank is too low on water. With this package, you get the humidifier, an AC power adaptor, a disk cleaning brush, the comprehensive user manual, a 2-year customer warranty, and full customer support 7 days a week. As far as disadvantages go, this humidifier is pretty small It wouldn’t work well for large living rooms or open spaces. It also only runs for 16 hours at a time before you’ll have to refill the tank. Compact – This humidifier would fit well on a side table or nightstand. Easy to use – An easy to use, clean, and operate option, this is a great choice for anyone new to using cool mist humidifiers. Great for improving sleep – If you struggle with allergies or breathing problems as you sleep, this may be a great option to consider. Fair price – This humidifier is well-made and comes with a great warranty so we feel that it’s priced well. Small – If you need to add moisture to the air in large or wide-open rooms, this may not be the best choice. Low-volume tank – You’ll have to refill the tank of this humidifier every 16 hours or so. Verdict: For anyone who wants to improve the air quality in their bedroom or office, this is a great option. It’s compact, easy to use, and of quality material design. It also doubles as a nightlight making it a great choice for bedrooms. On the other hand, if you need to moisturize the air in large areas or open spaces, this may not be the best option. Also, it shuts off after 16 hours or whenever the tank gets low. This means you’ll need to refill it a lot. 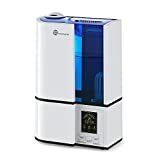 However, if you want to use it at night in your bedroom or temporarily to alleviate your cold or allergy symptoms, this humidifier would be a good candidate for the job. An adorable and whimsical cool mist humidifier that resembles a cartoon hippopotamus, this 1-gallon filter-free device is an awesome option for families with children. The tank is removable for easy refills under most bathroom sinks. It also runs very quietly for up to 24 hours at a time. The anti-microbial materials that this humidifier has been constructed of help to reduce mold and bacterial growth for clean and safe operation. The Ultrasonic cold mist easily humidifies around 500 square feet quickly and quietly. This can help make breathing easier and give children of all ages a better night’s sleep. Since this is a filter-free model, so you won’t have to worry about the hassles that accompany constant filter changes. If you live in a home with particularly hard water, however, there are certain demineralization filters available that can be purchased separately for this model. Another notable feature of this humidifier is its automatic shut-off sensor. When the water levels in its tank are low, it shuts off immediately to prevent possible damage to the spray nozzles. It also comes at a comparatively low price, a great selling point for small families. On the whole, this is a cute little vaporization device that would be perfect for small bedrooms, nurseries, or playrooms. On the other hand, it would look pretty out of place in a living room and may not be a great choice for large spaces. Also, it can’t be placed on wooden surfaces. You’ll want to keep this humidifier on a ceramic table or something similar to prevent possible damage to furniture. Adorable design – The adorable hippo design of this humidifier makes it a great choice for areas frequented by children. Large tank – The 1-gallon tank can be filled up easily in a bathroom or kitchen sink and gives users up to 24 hours of cool mist comfort. Low price – Comparatively, this humidifier is pretty inexpensive. No wood surfaces – Condensation tends to build up near the unit so you won’t want to place it on wood or carpet. Looks like a hippo – This model may look a bit out of place in a formal living room. Verdict: If you need a cute humidifier for a child’s bedroom or nursery, this is a great option. It’s easy to use, gives off 24 hours of cool mist, and comes at a low price. It can help infants breathe easier or reduce the cold symptoms of young children and adults alike. Keep in mind that it should not be placed on wooden surfaces because it tends to give off a good amount of condensation. Also, it may not be the best choice for waiting rooms or other professional spaces, as it won’t match formal decor. It’s a whimsical cool mist humidifier that would be great for anyone with kids. Now that you’ve seen some fantastic cold humidifier options, you’ll be able to make an informed decision as you shop. It’s also important to know how to use and care for a humidifier as well as what the differences between certain types of humidifiers are. Let’s take a look at some of the most frequently asked questions about humidifiers. How often should an ultrasonic humidifier be cleaned? Cleaning your humidifier will help to ensure that you’re breathing clean, fresh, and more importantly, safe air. The cleaning requirements of your device will depend almost entirely on the type of humidifier that you have. Some cool mist humidifiers have filters that simply need to be changed at designated intervals. Others will need to be cleaned after each tank runs dry. Still, others need to be cleaned every few days or so. You’ll find the cleaning instructions and recommendations for your humidifier in the included user manual. The easiest humidifiers to clean are those with replaceable filters. The most cost-effective humidifiers have permanent ceramic filters that don’t need to be cleaned as frequently. How to disinfect the tank? Disinfecting the tank of your humidifier can help you avoid the build-up of bacteria and possibly mold. It’s important to ensure that your humidifier tank is cleaned regularly. There are a few ways to clean the tank of your humidifier, and the type of humidifier you have will be the most important factor to consider when cleaning out its tank. You can clean the tank of most humidifiers by removing them and washing them with warm soapy water. You’ll then want to rinse them off with cool water. Some humidifier tanks are also dishwasher safe, though these are usually smaller humidifiers. Ceramic filter humidifiers have to be cleaned in a special way that will be designated in the instruction manual. Some humidifiers have replaceable filters for easier cleaning but we still recommend scrubbing out your humidifier tank every 5th use or so. You can also use a disinfectant that’s safe for plastic or a cleaner designed specifically for humidifiers such as these capsules. Once again, the user manual included with your humidifier will mandate the required proper cleaning procedures. Are cold mist humidifiers good for babies? Yes. Cool mist humidifiers are great for babies who suffer from croup or other cold or flu symptoms. According to mayoclinic, They help infants to breathe easier and are safe to use. For more on this topic, we recommend mayoclinic’s in-depth article on why you should have a humidifier for your baby’s nursery. Where in a bedroom should a humidifier be placed? The placement of your humidifier will depend on a few main factors. You’ll need to consider how close fabrics and linens will be to the device for one. You don’t want soggy curtains or moist couch pillows, after all. You’ll also need to know if your humidifier can be safely placed on the floor. The nice thing about cold mist humidifiers is that they’re generally safe to touch, so they aren’t generally a safety hazard on the floor. They do, however, tend to have lots of condensation build-up. This means that they can make a puddle on your floor, damage your carpet, or warp wooden surfaces. The good news is, many chill mist humidifier manufacturers are well aware of this issue. Most small humidifiers will require placement of 12 or more inches above a surface. You can also use them on ceramic or tiled tables. Larger humidifiers usually have directional nozzles for the aimed dispensing of humidity. Other cool mist humidifiers can be placed on the floor and have long nozzles that point straight up to dispense humidified mist evenly in the air. You’ll need to read your owner’s manual to find out where you’re actually supposed to use your humidifier. Basically, you’ll need to use common sense and remember that humidity is, well, wet. Are cool mist humidifiers compatible with essential oils? This will depend on the type and brand of cool mist humidifier you have but in many cases, yes. It isn’t only warm steam humidifiers that can be used with essential oils. 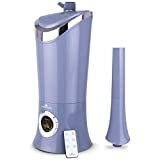 In fact, there are many small cool mist humidifiers that have been designed specifically to diffuse essential oils through the air for both health and aromatherapy purposes. Cold, chilly mist vs warm steam, what should I get? It will be up to you which kind of humidifier you purchase though we can definitely give you some information on how these two types of humidifiers differ. Essentially, cool fog humidifying devices dispense a cloud of tiny water droplets. They are safe and effective. They are also very efficient and easy to use. Warm air humidifiers dispense warmed steam for quick and intense humidity. They’re like tiny mellow saunas for your home. • Warmed steam – Warmed steam penetrates your pores and sinuses quickly. • Temperature control – You can control the temperature settings of a warm vapor/warm steam humidifier. • Kill bacteria – While opinions and results vary, warm mist humidifiers may kill some bacteria in the air. • Not as safe – Warm mist humidifiers can be hot to the touch and shouldn’t even be within reach of children. • May cause more damage – Warm steam penetrates surfaces easily and can cause more damage to your furniture, walls, or flooring. • Cost more – Warm steam humidifiers will usually cost you more in terms of maintenance and electricity usage. • Soothing cool – Cooled mist is pleasant to the touch and soothing. • Safer – Cool mist humidifiers are safer to use around your family, pets, and furniture. • Hygienic – Cool mist humidifiers are hygienic and generally easy to clean. • Year-round use – Cool mist humidifiers help you regulate air temperature and humidity levels throughout all of the seasons of the year. • More portable – Cool mist humidifiers are generally more portable than warm steam humidifiers. • Energy efficient – Cool mist humidifiers are by far more efficient in terms of water and electricity. • They don’t kill bacteria – Cool mist humidifiers can’t be used to kill bacteria in the air. Here are two more links on the contrasts between cool mist and warm steam humidifiers. This has been our comprehensive buyer’s guide for anyone looking to purchase a cool mist humidifier. We hope you’ve found our FAQ section helpful and that some of these impressive products sound like good options for your home and family. We want to know what you think! Are we missing any awesome options on our list? Which cool mist humidifiers have worked well for you in the past? We care about your feedback. Please feel free to leave your comments and let us know what’s on your mind.